We all know what a dirty bathtub ring looks like. Now imagine what that scum buildup is doing inside the plumbing of your Jacuzzi style jetted tub! Sure, you can clean the bathtub itself — but once you start up the air jets, all kinds of nasty looking bits and specks will come floating to the surface if you don’t properly clean the jets themselves and the interior plumbing system. That’s right, the jets and pipes behind your jet tub can quickly become contaminated with all sorts of infectious bacteria — some you can see, and some you can’t see! It’s called biofilm. More on that in a minute. Fortunately, cleaning the inside of your air tub’s elaborate collection of pipes, jets, and nozzles is really straightforward and easy! #1 – Check your bathtub’s manual to see what the manufacturer recommends. They typically specify which jetted tub cleaner works best for each make & model, as well as the ones you should avoid. Each air tub is different. Can’t find your original owner’s manual? Find Jacuzzi tub manuals and Whirlpool tub manuals online. Closing the air controls on the jets stops all air flow through them. Opening the air controls on the jets allows the air to flow freely through them. Some jetted tub manufacturers call for the air controls to be fully opened, while others recommend closing them — so it’s best to read the manual first to confirm which method is best for your specific bathtub. #3 – Fill the tub until all tub jets are submerged by 2 to 3 inches of water. If it has been awhile since you last cleaned the tub, then it’s best to fill the tub completely with hot water. 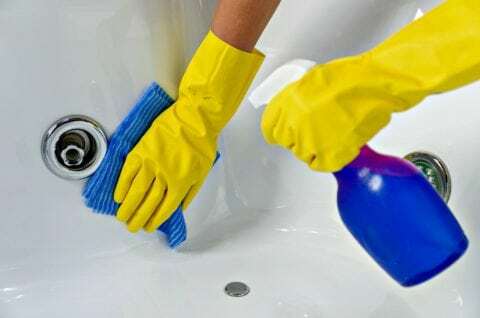 #4 – Make your own jetted tub cleaner using common household products or use use a jetted tub cleaner made specifically for cleaning air tub jets. #5 – Run the tub jets for 15 minutes. #6 – Drain the tub. #7 – Refill the tub with water (2 to 3 inches above the jets) and run the jets again for 10 minutes — to ensure that all of the jets are rinsed thoroughly. #8 – Drain the tub again. #9 – Wipe down the tub and nozzles. Use a soft cloth (like a cloth baby diaper) for the larger areas. Use a Q-tip to get into the cracks and crevices around the tub jets and nozzles. #10 – Finally, sanitize everything by removing the unseen biofilm — a residue that forms around bacteria in your plumbing lines. In order to prevent health problems associated with biofilm, it’s important to end your whirlpool tub cleaning routine with one of the many products designed to remove biofilm. Over time, your tub jets and nozzles may start to yellow or become discolored. This is a normal and natural process that occurs as plastic ages. In most cases, there is little that can be done to rectify this condition. Painting them is an option, though not a very good one — because with continual use in water, the paint is not likely to hold up very well and the resulting peeling or bubbling will look worse than the natural discoloration of the plastic. Without a doubt, proper cleaning of your jetted tub is very important and cannot be overlooked. Since moisture is always present in the jets and pipes of your air tub, bacteria can easily build up — and mold, mildew, and other health risks can quickly become an issue. For the everyday user, it may be necessary to clean and sanitize once a month. If you only use the jetted tub occasionally, you can probably get by with cleaning and sanitizing it once every 3 to 4 months.